The directors of League One side Bury have issued a statement scotching the bizarre rumours circulating this morning that Rangers were planning to buy the club and start again in the English league in a bid to resolve their current financial woes. Several newspapers were reporting that new Rangers owner Charles Green was preparing a ruse to buy out an English lower league club, i.e, Bury, re-brand it and then take up their fixtures as of next season should the Gers be jettisoned from the SPL next month (they’ve already been left off the official fixture list). “Whilst investment into Bury Football Club is always welcome, any offer of investment will only be viewed at taking the club forward in its only one guise possible – based in the town of Bury, and as Bury Football Club. “Bury FC is a proud historical club, and as such proudly represents the town, community, people, and above all supporters of Bury. Bury’s response was very polite considering Rangers allegedly asked them to stop existing in favour of a supposedly more important team. I’m hoping this is just tabloid nonsense. The whole idea is absolutely disgusting. We dont do franchising in Britain. Ugh , don’t these people realize that they can’t just buy their way into the league, clubs are formed on history , and not money , ugh , money is ruining football!!!! The way things are going, by the time the season kicks off there may not be a club formerly known as Rangers FC. 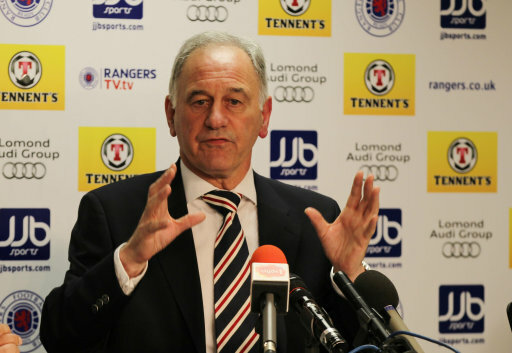 Rangers FC died last week and is being “reborn” into Sevco whatever number Charles Green bought cheap.